The U.S. growth outlook hangs more than ever on American consumers’ resilience amid stock-market swoons and trade-war tensions, but key data on their spending — the biggest part of the economy — will be missing due to the government shutdown. Was it a gangbusters Christmas shopping season as forecasts and anecdotal evidence suggested? Were consumers making big discretionary purchases in addition to essential spending as they entered 2019, even as some surveys showed confidence was waning? The answers will have to wait, as December retail sales won’t be released as scheduled Wednesday, Jan. 16, while the Commerce Department remains closed. Failure to reopen soon also would delay personal income and spending data, due Jan. 31. Together, those reports constitute the most widely watched measures of household consumption, which accounts for about 70% of the economy. The disruptions come at a challenging time: Plunging regional gauges of U.S. manufacturing and business surveys indicate a slowdown in growth, and some big-name retailers have issued warnings about mixed holiday results. While the solid job market remains a bulwark and consumers are in good shape, more — not less — information is needed to assess if the economy faces bigger-than-anticipated risks, one reason investors are nervous and Federal Reserve officials have emphasized patience in raising borrowing costs. With no end in sight for the shutdown, a burgeoning concern is that data may not just be delayed, they may also not get collected as normal, Brown said. For now, investors and analysts will have to rely on a patchwork of data. The Johnson Redbook report showed December sales rose from a year earlier, though it tracks a limited sample of results. The Retail Economist‐Goldman Sachs weekly chain-store sales figures are another source. Other groups provide clues on individual sectors, such as the National Restaurant Association’s monthly index. Without the government’s retail report, it’s also tough to accurately gauge how consumers are spending on big-ticket items such as cars. Meanwhile, Fiat Chrysler Automobiles NV’s Chief Executive Officer Mike Manley said he’s “concerned” about the shutdown’s impact on the company’s efforts to introduce crucial new heavy-duty pickups. The delay in government-issued economic releases “introduces a greater degree of uncertainty, which typically isn’t good,” said Jim Paulsen, chief investment strategist at Leuthold Weeden Capital Management LLC. “It does create some real risk of misinterpretation” as people compensate with other, sometimes partial, sources of information, like a retail CEO’s comments. The nuances in signals from consumers were evident in executive comments from Kroger Co., America’s biggest supermarket chain. “They feel incredibly good about the economy but very nervous about where things are headed,” Chief Executive Officer Rodney McMullen said Sunday in an onstage interview at the National Retail Federation’s annual trade show in New York. Credit-card results from companies including Visa and MasterCard would help fill some of the void. The Fed’s Beige Book release on Wednesday may also provide anecdotal details on spending and other parts of the economy. That’s why some investors are taking the data disruptions in stride. “In a world of big data, there are so many other ways to get a view of the consumer than the monthly numbers from the Commerce Department,” said David Sowerby, portfolio manager at the investment firm Ancora, which manages $6.9 billion. E-commerce sales during the holiday season jumped 16.5% from a year earlier, according to Adobe Analytics, which measured online transactions from 80 top U.S. retailers. Still, companies depend on broader economic data to make investment decisions, and without it they’re “to a degree, flying without any instruments,” said NRF chief economist Jack Kleinhenz. The Commerce Department’s monthly data are crucial to get a bigger picture because about 90% of retail sales come from small businesses, he said. Recently, several large publicly traded retailers such as Macy’s Inc. and Kohl’s Corp. provided discouraging updates. “It was disappointing news, but I don’t know how pervasive that performance was,” Kleinhenz said. The trade association itself is somewhat in the dark until the government releases the data. Without official numbers, “we can’t provide our final report this week either” on holiday spending, according to NRF spokeswoman Ana Serafin Smith. Shares in US retailers are on course for their biggest quarterly sell-off since the financial crisis, putting the sector at the sharp end of Wall Street’s mounting concerns about the global economy and President Donald Trump’s trade wars. In a sudden reversal of the cautious optimism that had crept in this year over the industry’s ability to cope with the ecommerce revolution, S&P’s index of 95 leading listed retailers has dropped 17 per cent so far this quarter. The market downturn has gathered pace just as the festive shopping season gets into full swing, in spite of a series of upbeat predictions about Christmas sales. Jack Kleinhenz, chief economist at the National Retail Federation, has nudged his forecast for the holiday period higher after commerce department figures on Friday showed core retail sales surged in November by the most in a year. Investors said the sell-off, which puts the sector on track for the steepest quarterly decline since the final three months of 2008, reflected worries about gathering storm clouds for retailers next year. Luxury, middle market and budget retailers have all been hit hard. S&P 500-listed losers include upscale jeweller Tiffany, down 36 per cent for the quarter so far, and mass market chain Target, off 23 per cent. Concerns include retailers being forced to shed stock at hefty discounts, in part because they have accelerated shipments through ports to avoid being subjected to higher tariffs, which the Trump administration has since put on hold. Chad Kessler, global brand president at American Eagle Outfitters, said rivals were still being “pretty promotional” since the Black Friday sales. “It seems like a lot of retailers have kind of maintained their Thanksgiving week promotions through the month so far,” he said. Even companies thought to have successfully weathered the rise of Amazon have been caught up in the rout, including electronics retailer Best Buy, which is down 30 per cent. The sell-off has erased all gains from earlier this year, when investors drove a rally in retail stocks on signs that a strong US economy and tax cuts were helping bricks and mortar companies deal with the online threat. “People went from saying the mall is dead to the mall is back with a vengeance,” said Simeon Siegel, analyst at Instinet. “The reality is that it never died — but it was also never as healthy as people thought.” The US economy remains robust and Mr Kleinhenz now anticipates retail sales for the season to come in at the high end of the National Retail Federation’s previously issued forecast of a year-on-year rise of 4.3-4.8 per cent. However, Michael Arone, chief investment strategist at State Street Global Advisors, said: “Investors are concerned more about the longer-term outlook for retail — and the broader structural trends, such as the shift online.” Weak economic data from Europe and Asia — figures on Friday showed retail sales in China grew at the slowest pace in 15 years in November — have meanwhile added to fears about a global downturn. Analysts also pointed to concerns that trade tensions would force US retailers to either risk volumes by raising consumer prices or absorb higher costs themselves, especially if higher tariffs were implemented next year. Executives have sought to reassure investors that they can minimise the impact on profits. Jack Calandra, chief financial officer of men’s clothing company Tailored Brands, said last week it was halving the proportion of products it sourced directly from China from 30 per cent to 15 per cent. Shares in Amazon have dropped 20 per cent for the quarter so far, paring its market capitalisation to $778bn. S&P’s Select Retail Index is equal-weighted, meaning the decline in Amazon’s stock has not had an outsized impact. A lot of people will shop for the holidays! And they’ll buy online! And they will look at their phones a lot, too! It’s that time of year again, folks, when we retail reporter types can sometimes spew breathless pronouncements on the sometimes not-so-revelatory predictions pundits make on the make-or-break holiday selling season, when merchants generate a disproportionate chunk of their annual sales. Here’s some predictions worth noting. Let the games begin. The National Retail Federation expects holiday retail sales in November and December — excluding automobiles, gasoline and restaurants — to rise between 4.3% and 4.8% over 2017, for a total of $720.89 billion. The forecast compares with an average annual increase of 3.9% over the past five years. “The combination of increased job creation, improved wages, tamed inflation and an increase in [consumers’] net worth all provide the capacity and the confidence to spend,” the NRF’s chief economist Jack Kleinhenz said, in a statement. Online retail will be the most popular shopping destination, with 60% of consumers planning e-commerce gifting this holiday season, according to a Deloitte survey. An estimated 57% of holiday dollars will be spent online, eclipsing in-store purchasing, which is forecasted to account for 36% of consumer spending. More than 70% of shoppers surveyed noted free shipping, while two-thirds cited time savings and home delivery, as the key reasons they’ll buy online this holiday, the survey found. Of the nearly 50% of consumers who plan to use their smartphones to shop this holiday, 67% plan to use mobile to make a purchase, up from 57% last year. Mass merchants are the second most popular venue for holiday shoppers (52%, up from 44% in 2017). Traditional department stores and off-price retailers round out the top-four shopping destinations. Over the last five years, U.S. consumers have diverted more of their holiday budgets to experiences such as home entertaining and socializing away from home, which now represent 40%, or $611, of survey respondents’ planned holiday budgets, the Deloitte study found. While physical gift purchases, from clothes to household appliances, still dominate holiday purchases, they’re down trending. The number of shoppers who plan to buy a product has dropped 11% from 2017, according to Accenture. By contrast, shoppers planning to buy an experience or service-geared gift, from a meal out and a concert ticket to a cleaning service, rose 5%. An estimated 49% of younger Millennials plan to spend more this holiday than in 2017, while only 13% of their Baby Boomer counterparts expect to spend more than they did a year. And Generation Y’s shopping venues will reflect their belief system. For example, 54% of younger Millennials said retailers have a duty to address broader social and political issues, such as diversity, be it gender, ethnic or disability inclusion, and they will reward merchants that do just that: 51% of younger Millennials surveyed are more likely to shop at a retailer that demonstrates awareness of these issues, the Accenture study found. “Our research suggests that younger Millennials are more likely to choose one brand over another if that brand demonstrates inclusion and diversity in terms of its promotions and offers, their in-store experience, their product range, and their environmental awareness,” said Jill Standish, senior managing director and head of Accenture’s retail practice, in a statement. I’ve been a business journalist specializing in the retail industry for over a decade, covering consumer news, company profiles and industry analysis pieces, as well as the intersection of business news and shopping, fashion and social trends. Retail sales increased 5% year-over-year in March, with seasonally adjusted month-to-month sales jumping a slight 0.3%, according to the National Retail Federation (NRF). The three-month average from January to March increased 4.8% over the same period a year ago. These results are in line with initial NRF forecasts indicating that 2018 retail sales would grow between 3.8% and 4.4% compared to 2017. The March results build on the higher sales seen in February, which was up 0.2% over January and 4.3% year-over-year. These numbers exclude sales of automobiles and at gasoline stations and restaurants. The NRF numbers are based on data from the U.S. Census Bureau, which said overall March retail sales — including automobiles, gasoline and restaurants — were up a seasonally adjusted 0.6% from February, and up 4.5% year-over-year. All sectors except sporting goods saw sales improvements in March on a year-by-year basis. Sporting goods stores saw sales declines of 0.9%. Health and personal care: up 0.4%. Retail sales in April (excluding sales from auto dealers, gas stations, building materials and food services) rose 0.4% from March 2018, according to the latest monthly report from the U.S. Commerce Department’s census bureau. March sales were revised upward to a 0.8% rise, from the previously reported 0.6%. Nine of the 13 major retail categories posted positive sales results in April compared with March, according to retail think tank Coresight Research’s breakdown of the report. Clothing and accessories rose 1.4%, furniture sales rose 0.8% and e-commerce rose 0.6%. But health and personal care sales fell 0.4%, and electronics and appliance sales fell 0.1%, the Census Bureau said. E-commerce sales in the period rose 9.6% from last year, while overall retail sales excluding auto rose 4.8% year over year, according to the government’s report. April marked another month of robust sales for retailers, despite a cold spring in many parts of the country, thanks to an overall healthy economy. And tax cuts could help mitigate the rise in gas prices this year, according to NRF Chief Economist Jack Kleinhenz. But it’s worth looking at just where shoppers are spending the most: As first quarter reports have come in for 39 retail chains tracked by Retail Metrics, retail earnings are up 15.8% year over year, with just four retailers accounting for all that reported growth. Drugstore chains CVS and Walgreens both turned in “sizeable” first quarter surprises that accounted for about 300 basis points of reported earnings growth, according to a Retail Metrics note emailed to Retail Dive. Costco was responsible for another 300 basis points of earnings growth and Home Depot, which reported a 20% year-over-year first quarter operating income boost this week, is responsible for 1,000 basis points. Without Home Depot, CVS, Walgreens or Costco however, reported Q1 retail earnings fell 0.7%, according to Retail Metrics. E-commerce continues to outpace in-store sales, according to two indices of U.S. retailers from ProShares, measuring year to date sales through market close on May 14. The Solactive-ProShares Bricks and Mortar Retail Store Index (which includes leading legacy retail companies) fell 3.08%, while the ProShares Online Retail Index (which tracks tracks U.S. and non-U.S. retailers primarily selling online or through other non-store channels with a market capitalization of at least $500 million, including Amazon) rose 19.26%. The National Retail Federation said that retail sales in April showed a 2.8 percent year-over-year increase in the U.S retail market, excluding auto sales, gasoline stations and restaurants. The NRF broke down April results for different retail categories. Results were mixed for apparel stores. Sales for clothing and clothing-accessory stores dipped 0.4 percent in a year-over-year basis. However, April apparel sales were up 1.4 percent compared to the previous month. Online and other non-store sales were up 12.2 percent in a year-over-year comparison. Compared to the previous month, sales increased 0.6 percent for e-retailers. Ken Perkins, president of the market-research group Retail Metrics, also posted a recent note saying business was good in April. 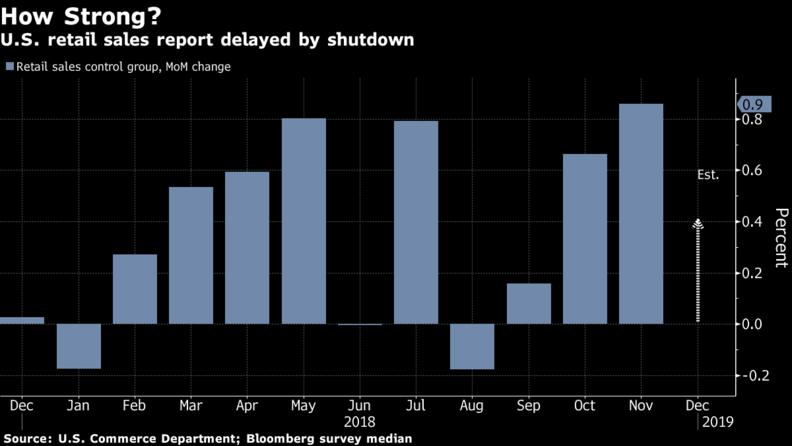 He said that expectations for the month had been low because cold weather was predicted for much of the U.S. Wall Street analysts also forecast that many consumers may have been suffering from shopping fatigue. The nation’s retailers experienced a spike in business because Easter took place on April 1. In Perkins’s research note, he discussed the April performance for L Brands, the parent company of Victoria’s Secret and Bath & Body Works. Bath & Body Works reported a 6 percent same-store-sales gain during April. Victoria’s Secret posted a 2 percent decline. April’s retail sales were 0.4 percent higher compared to March and 2.8 percent higher compared to a year ago. The sales data, from the National Retail Federation, does not include sales at gas stations, restaurants or auto sales. he retail industry employment increased by 28,800 jobs seasonally adjusted in May over April and 100,200 jobs unadjusted year-over-year, the National Retail Federation said Friday. The numbers exclude automobile dealers, gasoline stations and restaurants. Overall, U.S. businesses added 223,000 jobs, the Labor Department said. “With the unemployment rate of 3.8 percent at its lowest since April 2000, this shows that many industries, including retail, are hiring and creating jobs at a steady pace. We expect this rate to continue to decline as the fiscal stimulus and tax cuts are further absorbed in the economy,” Kleinhenz said. May’s numbers followed an upwardly revised combined increase of 19,300 jobs for March and April. The three-month moving average in May showed an increase of 19,000 jobs. Retail registered monthly gains nearly in all segments with the most robust increases concentrated in three sectors: general merchandise stores, which were up 13,400; clothing and clothing accessory stores, up 6,500 and building and garden supplies, up 6,000. Losses were concentrated in two sectors: health and personal care stores, down 800 jobs and non-store which includes online, down 1,100 jobs. Economy-wide, average hourly earnings in May increased by 8 cents–2.7 percent–year-over-year.